If you need a roof inspection in West Linn, West Coast Roofing is the company you can trust to provide a top quality West Linn roof inspection. In West Linn, regular roof inspections are vitally important to protecting your home from the weather in the Pacific Northwest. A proper roof inspection will help you evaluate the overall condition of the roof and help you identify leaks and potential leaks before they cause damage to your West Linn home. 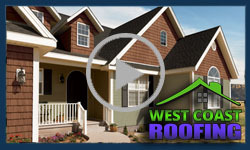 West Coast Roofing is committed to providing you with an exceptional West Linn roof inspection. Rest assured, we will thoroughly examine the entire surface of your roof. If we discover small problems, we can often make those minor repairs at the same time as your West Linn roof inspection. For larger problems, we’ll leave you with a full understanding of the work required and a detailed estimate of the cost of those repairs. Clean and inspect the condition of your gutters and downspouts and verify that they provide enough water shedding capacity for your roof in West Linn. Insect all of the flashing present on your roof and repair any loose or missing pieces. Provide a detailed description and estimate for any major repairs necessary to prolong the life of the roof on your West Linn home. In West Linn, roof inspections should be performed annually and after any severe storms, especially if you own a home with an older roof. Roof inspections are an important preventative maintenance step that helps you maximize the performance and prolong the longevity of the roof on your West Linn area home. If your roof has been damaged by a storm, insurance companies generally allow you to file a claim for up to a year. Often damage caused by hail storms or other severe weather is not visible from the ground or to an untrained viewer. If your roof was subjected to a severe storm in West Linn, it’s important to have your roof thoroughly inspected by an expert as soon as possible. West Coast Roofing will work with your insurance company to document the damage to your West Linn area roof, meet the roof inspection requirements of your insurance company, and ensure that you receive the compensation required to repair the damage to your roof in West Linn. Is your home in need of a quality roof inspection? Contact us today to schedule your West Linn roof inspection!